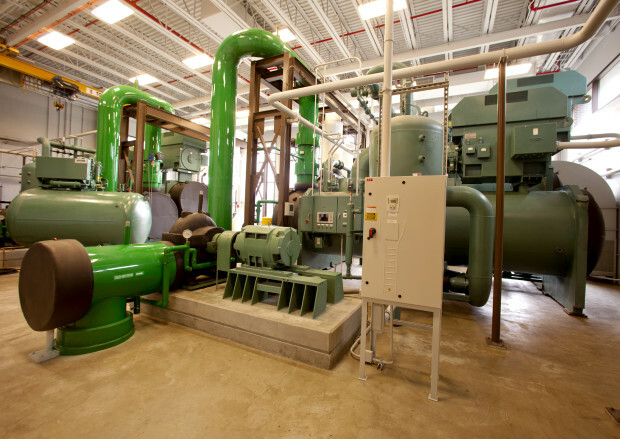 On April 10, Ball State University will host a second gathering of academic and facilities personnel interested in knowing more about the design, installation and operations of district-scale geothermal heat pump chiller technologies. Specifically, we will share our experience with installing the largest such system in a North American University. As of this date, fully 47 buildings are connected to the system for cooling and some 22 buildings have been connected for heating this winter season. Once the south field of bore-holes is completed and the south energy station becomes operational, the remaining 25 buildings in the south half of campus will be connected to the heating loop of the system. Within the next 18 months, the entire campus heating and cooling needs will be fully met by the district-scale geothermal heat pump chiller system. The April conference will provide an opportunity to learn more about the technology by seeing firsthand the installation and operations of the system. Featured speakers include those representing the national Geothermal Exchange Organization, and the applications engineer and account executive working with Automated Logic United Technologies who has provided the dashboard-based controls of our system. In addition panel discussions on design, drilling and equipment will be provided and tours of the building-by-building HVAC interface, controls and equipment, and south bore hole field drill site will be available. Moreover, the gathering will include presentations on how the Ball State University installation is being used as a platform for research and education by faculty in the College of Sciences and Humanities; as monitoring wells are used to track day-to-day performance in real time and the profiling of thermal energy exchange across the ground layer strata are developed as part of a longitudinal study of system operation and impact. Review of these practices and techniques will be included in the facility tours. Ball State University decided to host these gatherings twice a year as a way to leverage more fully the value of its district-scale geothermal installation. Not only is the goal to use this as a research and teaching platform, but to share with the world our experience so that other members of the academic and operations sub-sectors of higher education can begin to build peer-to-peer networks as installations begin to propagate across the country. We are hopeful for a sizable turnout as happened in November with our first offering of the conference and look forward to participation by a rich mix of students, faculty, operational staff and administrators. More details on program and scheduling are available from the central sustainability web page at Ball State University, www.bsu.edu/sustainability. in March of 2012 and featured the dedication of the university’s campus-wide geothermal district heating and cooling system. He is the university liaison to the American College and University Presidents Climate Commitment (ACUPCC) and the Sustainability Tracking Assessment and Rating System (STARS).In addition he is a Founding Member of the Board of Directors of the Association for the Advancement of Sustainability in Higher Education (AASHE) and the Formal Education Committee of the U.S. Green Building Council (USGBC).